From this Ebay Ad comes an interesting paddle. The seller claims it is a "very early old Indian made wooden paddle". It looks to have been finished with some sort of ochre-coloured paint with the exception of the end of the grip. It's a huge monster at 96" long (wow!) with a 6 - 3/4" wide blade. Normally this length is associated with rowing oars but the distinctive grip point to some sort of stand-up paddling usage. Undated Canoe Paddle, 96" x 6 - 3/4"
The length and shape remind me of this earlier post featuring an 1898 photo of Athian Lewey at West Grand Lake, Maine posing with 2 tall paddles & a birchbark canoe. The paddle leaning on the inverted bark hull shows has a similar slender profile and some peeling paint on the blade. I'm not totally familiar with this area in Maine, but have read about Grand Laker Canoes - large 20ft+, square back, cedar canvas freighter canoes used by locals & guides. When not using an outboard motor, these large canoes would often be maneuvered with likewise large paddles. Another example of large paddles like this being used are for the Cree freight canoes in the far north. 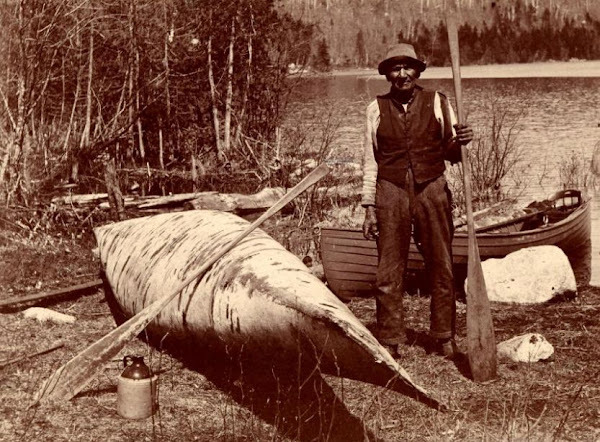 Doug Ingram of Red River Canoe documented large push paddles used up in Fort Severn that were 88" long - see his photos of Fort Severn Freight canoes & paddles here). Don't think I'll ever have use for an 8ft long paddle but this Ebay item sure looks like pretty bit of history at any rate.